Le Cerisier is a delightfully converted hay barn offering premium quality accommodation for five, in one King size bedroom (with child bed, if required) and one twin room. Large 13m x 6m heated pool. Maison Jacques is a large Charentaise village house which has recently been renovated to a very high standard throughout. Le Pommier is a delightfully converted hay barn offering premium quality accommodation for six, in one King, one double and one twin bedroom. Large first-floor balcony with fantastic views. 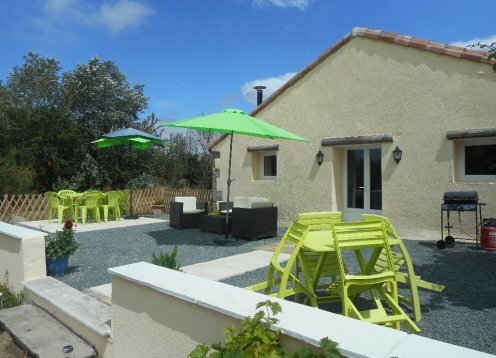 The gite is a converted 2 bedroomed stone cottage with a big modern kitchen,large comfortable lounge with a sun facing floral terrace near the pool and lawn. A 2 bedroom gîte situated overlooking two private fishing lakes, graded 3 'epis' by Gîtes de France (high comfort). Le Tilleul offers premium quality accommodation in two separate and independent gites with enough space to unwind, away from the hustle and bustle of everyday life! Large (6m x 13m) heated pool.